I am (I think) a generally healthy person—OK, some aches and pains that I try not to dwell on, and some problems that are readily treatable/fixable--(like being overweight, and associated side effects) I also have some mixed feeling about modern medical care. So lately, it's been all appointments, and tests, examinations--Done with more and more equipment, because machines are able to find stuff that a simple physical exam can't—and goodness knows, they have been feeling me up and down, looking with their fingers to find SOMETHING. So a good part of yesterday was more doctors, who, having worked hard looking, they have found something--not something they can feel (try as they might) but something a machine can see. And now, of course want to use another machine to look at what they found --and then exam it further with still more machines, on an even finer scale. Not that they have actually found a lump—no, just a pre-lump thickening! I am (let me repeat my self) a generally healthy person. I will placate the doctors, and let them look closer at my not quite yet a lump, closer, with another piece of equipment that will exam it at yet a finer, more detailed, microscopic scale. I am sure the result will be nothing—except now they will have an excuse to look again and again, waiting, HOPING to find something wrong. I am not sure how compliant I will be with their repeated desires to look again and again. I am humoring them to let them look as much as they have. But at least, while waiting for them to feel me up and down, and peer at me with instruments, each of which work at an every finer scale, I can knit. So another inch added to May's socks—almost 6 inches now of leg. 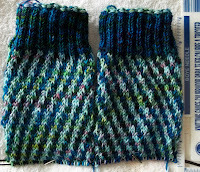 Another inch and it will be time for a heel flap. 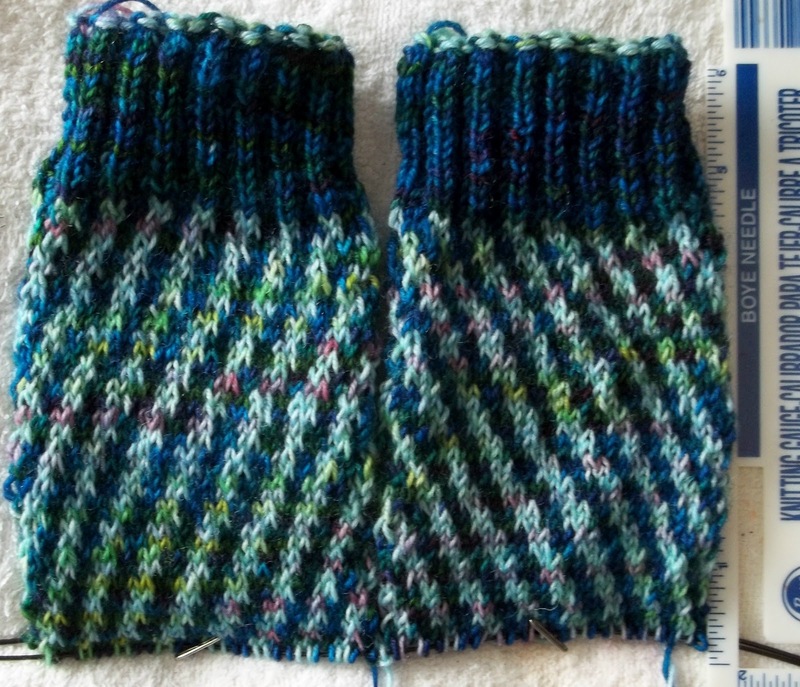 These socks are a joy to knit. I just love the colors, and the subtle color changes—It's a bit easier to see how the green and purple shades spiral round (sort of pooling) in the light color, but the same thing is happening with the dark blue/teal/plum color way. 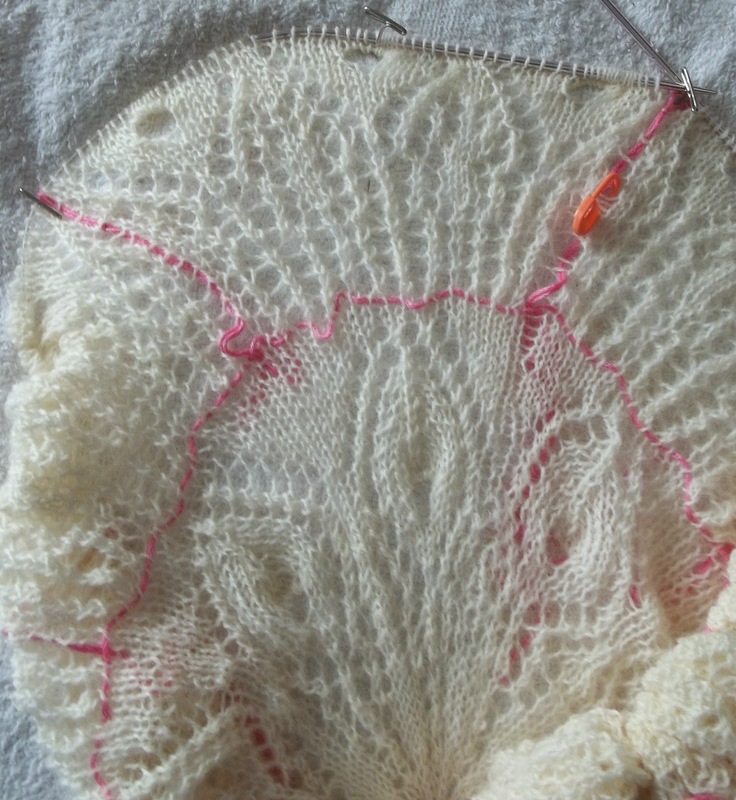 Plus there is a stitch pattern –that spirals, too. Lots of movement—on several levels going on at once. They are lively—in a very subtle way. Generally speaking, I am not a subtle person—but I do like these subtle details. And the Peacock shawl? Round 75 completed--(Chart 2 covers R's 45 to 95) and a thousand eyes are staring at me—OK, not a thousand, but 30--(plus the 10 from chart 1). There are now 660 stitches in a round, and while there will be some decreases over the next 20 rounds, it will not near as many as the increases—so the net count will only go down 100 stitches or so.. (to a mere 500 and something stitches per round). These are long rounds, even for me, and even on the alternate rounds—Which in theory are plain knit, but in reality are plain knit for the first half of the motif (in the pattern round there are frequent pairs of YO's and K2tog). 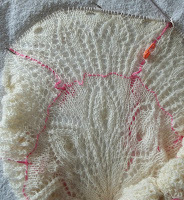 Then I work EASTERN wrapped knits for the second half of the motif—so that instead of SSK's, I can do reversed k2tog's. The knit stitches created with the EASTERN wrap are pre “turned” (no need to slip to re-orient the stitch position). It makes the plain row a bit slower, but I think it also make the left leaning decreases neater, and for sure, easier. I think the slip slip is the time when it's mostly likely to drop a stitch--(well it is for me, for sure) and by eliminating that step, I am more confident in my knitting—something that is important is this super fine, loosely knit item. The stitches are beginning to bunch up on the needle—but not so much that I feel the need to move to a longer one, (I think I have a longer one—but I am not quite certain—I haven't really looked yet) or to divide the stitches onto 2 needles. My blog contest is closed—this afternoon, some small work to assign numbers to all the posts, and find a random number generator and pick the winners. Thank you all for joining, and for all your kind wishes. I hope a percentage of you continue to visit my blog, and become regulars (as I have visited your blogs)-- With 4 prizes, and 40 entrants, you all have remarkable good odds at winning something. This post makes me think of Monty Python and the machine that goes Ping! Wishing you continued good health and relief from worry!